﻿SPPOT (Supporting People & Pets through Opportunity & Training) is an innovative Community Interest Company which interests and inspires people who encounter it, whether they are the people for whom the organisation was set up, people who love dogs or fellow professionals working in either of SPPOT’s dual spheres. SPPOT’s founder and Operations & Development Manager, Kerri Bee, set SPPOT up after realising, through a practice and management background in social care, that many disadvantaged people who value companionship and acceptance from dogs have few opportunities for flexible training and voluntary work services in the field of dog welfare. In addition through working as a Canine Behaviour Advisor, she also discovered that there is a lack of affordable services for dogs in Pembrokeshire and beyond, like dog walking and home boarding, especially for vulnerable dog owners. Together with a group of enthusiastic volunteers, SPPOT was created - a unique synergy based on a fundamental understanding of the needs of people and how they dovetail with the needs of dogs along with sound business principles, wide experience, skills, passion and entrepreneurial spirit. SPPOT is an Agored Cymru Recognised Centre enabling us to deliver accredited training courses, many that we have written ourselves, in canine training and welfare for various vocations and careers. 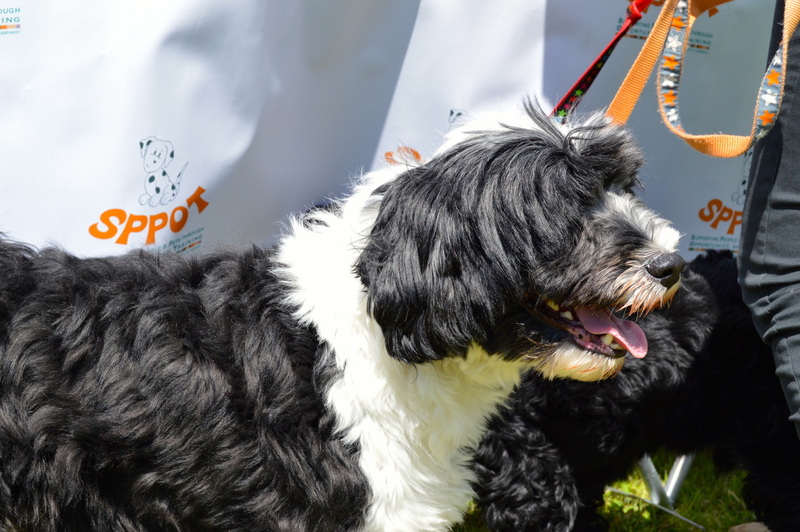 We train people who are ‘furthest from the job market’ to become part of SPPOT’s volunteer team as dog walkers, home boarders, training class assistants and instructors. Featuring some of our volunteers (canine & human!) and learners, the SPPOT Team put together this video as part of our winning submission to the Aviva Community Fund. N.B. All the images shown here are of dogs that have enjoyed training with SPPOT or have participated in our events. If you would like your dog to feature on our website, get in touch! In 2015 we were awarded £10,000 from the Aviva Community Fund and £68,000 over three years from the Rank Foundation, which funded 12 people to complete the training, a part time Dog Walking Project Coordinator and the Operations & Development Manager. In 2016 we concentrated on developing our dog walking service and trained 12 more people to become Volunteer Dog Walkers. joining the seven people already engaged in voluntary work as dog walkers. Also in 2016 we were awarded £5000 from the Caring Communities Innovation Grant and £5000 from the Big Lottery's Awards for All which enabled us to employ two part time staff as Dog Walking Project Coordinators until March 2017 and train another eight people and help equip our new Dog Daycare service. We continue to deliver the long established dog training and behaviour services for the general public and their dogs, having taken on a new Trainer and Behaviour Advisor, Rachel, to further develop this side of the enterprise across the county. The dog walking & daycare services are offered at a competitive rates for the general public with a significant concession for other vulnerable people in the community. Thus we can bring together the needs of two people, through shared care of a dog, benefitting both people and the dog. Dogs are scientifically proven to be of significant health and social benefit to people, therefore SPPOT’s progressive enterprise model will reduce dependence on health and social care services which are already under strain. People also have the capacity to reduce the suffering and neglect of dogs. Society in the UK is still geared towards fully able people and it remains incredibly difficult for disabled people to find truly flexible, supportive employment. In order to claim government benefit, people with long term disabilities and illnesses must focus on what they cannot do, in order to qualify for money to live. SPPOT focuses on what people can do, for example, we will focus on a person’s ability to work six hours a week for eight months of the year. The current mainstream system simply rejects people who cannot work 48 weeks of the year. The SPPOT Team has enormous collective experience and wide ranging skills and fully understands the requirements of commercial business and also traditional health and social care services but believes there needs to be a fundamental shift in the UK’s attitude to people who have long term barriers to full employment, towards ‘can train’, ‘can learn’, ‘can work’ and ‘can help others’.